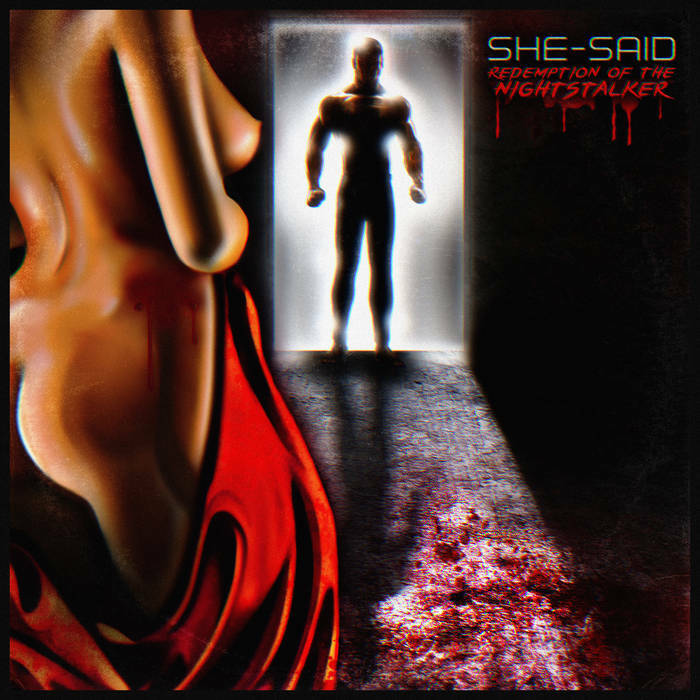 SHE-SAID has released his horror film inspired “Redemption of the Nightstalker” EP on Bandcamp. It has been available on Soundcloud for a month, but not in glorious FLAC Quality! From the first “Nightstalker’s Theme” track’s Slow start, Like a classic killers theme. A Psychopaths death march you cannot escape, to the fourth “Night” track’s reigned in, more traditional Synthwave vibes. This EP can satisfy a variety of tastes. This is a 6 track EP. Short, Sweet, and best of all? Name your own price. You have no reason not to pick it up! The album art is also fantastic, The ample rear, the natural tear drop breastesses. The arch of her back, while staring down this hulking behemoth, this full-bodied red wine, NAY!, This Adonis like man who is shrouded in mystery. a Lover perhaps? The NightStalker himself? Maybe she is an accomplice that is in on his AM Escapades or maybe even more sinister still, His next victim.